The identifying features of the Mayan civilisation started coming into being during the Preclassic Period ranging from 2000 B.C. to 250 A.D. During this period, Mayan villages evolved into Mayan towns and cities and many prominent features of the civilisation such as a writing system, complex calendar and prominence of the Jaguar as a religious symbol came into being. During the Classic period, the civilisation comprised of different city-states, powerful and rich with well-defined aristocracy. These city-states traded with each other, had alliances and together formed the mass of the Mayan civilisation. 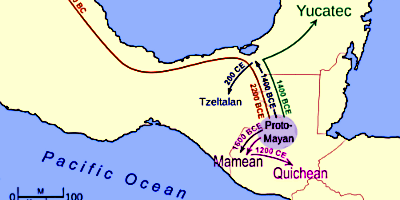 The end of the Classic Period resulted in the collapse of the Mayan civilisation in the southern region and the centre of the civilisation was shifted to the northern region. 1 Mayan Classic Period  300-900 A.D.
Mayan Classic Period  300-900 A.D.
Classic period of the Mayan civilisation marks the peak of its power, influence and cultural prowess. Many major city-states of the civilisation rose to prominence during this era. These included Tikal, Calakmul and Copan. City-ward movement of population increased and cities like Tikal, Calakmul and Copan came to host huge populations, sometimes exceeding 100,000. Military alliances were forged between states and intellectual and artistic development in Mayan cities flourished. In the 9th century A.D., the central Mayan region hosting most of these major city states collapsed due to numerous factors, including increasing population, corresponding environment changes and the archaic nature of the ruling system among others. The post Classic period of the Mayan civilisations marks a significant shift of the Mayan populations, and cultural centres, from the central region to the northern lowlands and Mayan Highlands. The cities of Chichen Itza and Puuc which had been able to survive the Classic era collapse, lost their grandeur by the 11th century. 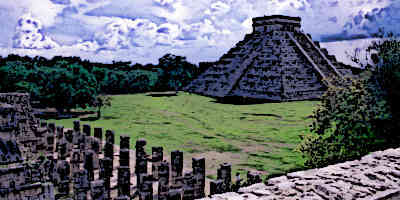 The major Mayan power that prominently existed during this era was the city of Mayapan which rose in the 12th century. However, much like the Classic era collapse of southern Mayan city states, Mayapan also collapsed in 14th century which led to a long time of warfare in the region. The Spanish exploration of the Mayan region of Yucatan began in 1517 A.D. 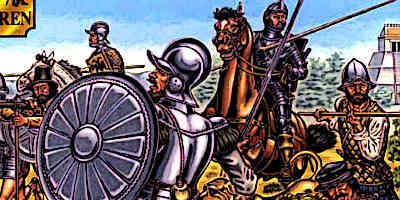 Between 1517 and 1519, Spanish were pitted against Mayans in a number of battles. The decisive blow came after 1521 when Hernan Cortes secured Spanish hold over the Aztec Empire and sent expeditions to subdue the Mayan areas. The Kiche capital of the Mayans fell in 1524 and the fall of the Zaculeu city came about in 1525. The Kaqchikel people fled from their towns and launched a long rebellion against the Spaniards which ended in 1530. It then took a series of battles and many years for the Spanish to conquer the Yucatan Peninsula by 1546. Tikal was one of the most ancient Mayan cities that existed during the Pre-Classic Period but rose to power and influence during the Classic Period of the Mayan civilisation. Between 200 and 900 A.D., Tikal came to be the most prominent Mayan power in the region and forged links with not just other Mayan cities but also major cities in other parts of Mesoamerica. At its peak, the city had a population of 120,000. Mayan warriors received elaborate physical training which included exercises and drills. Every able bodied Mayan male could be summoned to participate in the war by the military chiefs who mostly came from the aristocracy. Full-time mercenaries were also used in battle, in contrast to regular soldiers who generally had farming as their primary occupation. Some records hint that in Postclassic period, some Mayan women also took part in warfare. Mayan art was commissioned by the rich and was exclusively limited to the nobility. It included sculpted beads and other artifacts as well as relief panels carved in limestone. Mural painting was common and eccentric flints were produced by artists using obsidian. Ceramics were extensively produced in Mayan cities and were painted to depict different scenes from daily life. 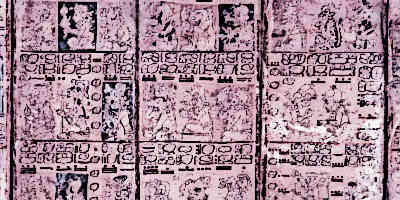 The Mayan calendar was the most complex dating system in the Mesoamerican cultures. The Mayan were very proficient in astronomy and were able to predict events such as eclipses and lunar cycles with great accuracy. The Mayan calendar used three parallel cycles of time; the first of these cycles had a length of 260 days, the second had a length of 365 days while the third cycle had a length of 52 years. Mayan civilisation had to rely heavily on agricultural produce to sustain the huge populations of the cities. This is why Mayan introduced many innovations in farming and deployed various techniques such as terracing, raised fields and home gardens. Major agricultural products were maize, cotton, beans whereas home gardens were usually used for growing vegetables. Cocoa was also produced and consumed by the rich in the Mayan society. Early Mayan temples resembled huts with thatched roofs but as the civilisation progressed, the temples were increasingly built on top of pyramids made of stone. Roof combs were also used on top of the temples by the Classic period. Often the temples were topped with shrines for different deities. In Preclassic Mayan cities such as El Mirador, triadic temples were constructed which were significantly larger than pyramidic temples of the later era. Mayans also constructed temples which were dedicated as observatories for the celestial bodies and their movements. The Mayan religion was derived from the Mayan mythology according to which there were thirteen levels in heaven and nine levels in the underworld. The deceased ancestors were considered the intermediaries between the living world and the supernatural world, especially the underworld. Kings were considered the symbol of ultimate religious power as well, apart from their political power. The priests were tasked with overlooking the rituals and most of the knowledge such as language, writing, astronomy and history were tasks specific to the priests. Mayan towns and cities had started coming into being by 500 B.C. 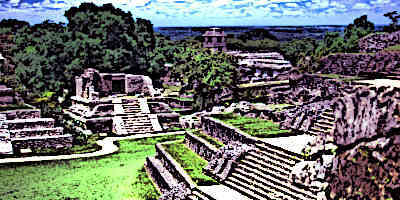 From 250 A.D. to 900 A.D., the Mayan civilisation saw the rise of many great city-states such as Tikal, Calakmul and Copan. By the 9th century, most of these cities had declined and the centre of Mayan civilisation shifted from southern regions to the northern regions and lowlands where cities like Yucatan and Mayapan rose to prominence after the 9th century. It was in this era that cities like Chichen Itza and Puuc also lost their grandeur. By the 16th century conquest of the Spaniards, Mayan civilisation centred on many influential Mayan states in the Guatemala region. 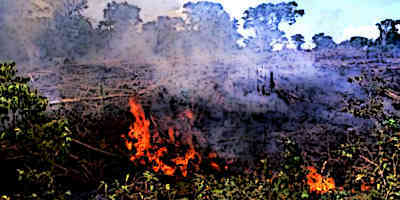 However, the Spanish conquest brought an end to the might of the Mayan civilisation.